How does one begin to describe the experience I’ve had only 6 days into this amazing journey? My first impressions of this foreign land tell me that “this is not normal”, but the truth is its just life that I’m not accustomed to. Cows and dogs roaming the streets, garbage and a polluted stench in the air. I’m thinking “how could someone survive more than a day here?” However as I’ve settled in to this place I call home for the next few weeks I’ve come to realize that its really not bad at all, its rather amazing. The people are friendly, the food isn’t to shabby and the smell…well it still smells. As a beginner to the Ashtanga practice my body has aches and pains all over after only 4 days. The thought of waking up at 4:30 am was unappealing to me at first and now though i find its really not bad at all. It just means ending my day early although that’s not a problem at all. The walk to the Shala in the morning is tedious but after my practice I feel refreshed and rejuvenated. Every day my practice seems to ease along up to the point where Saraswathi tells me to contort my not so flexible body into postures I’ve never done before. I love it though. I’m really becoming to understand why my Mom has such an obsession with the Ashtanga yoga practice. Chanting is at 10 am on Monday, Wednesday and Friday and Yoga Sutra on days in between and on Sunday. The 2 other classes really seem to compliment my practice and give me an understanding of what the point of everything I’m doing here is. At first I thought that my Mother and I were the only “white people” in this city, but as the days went on we met more people from all other the world. Brazilians, Spaniards, English and even people from Wisconsin. It’s great to finally find out were not in this alone. I’ve really come to be more relaxed with this whole situation. Though I’m not strictly a vegetarian and would much rather enjoy a juicy steak and a fat burger with fries and a milkshake, I’ve come to really like the masala dosas and briani, but its always great to get a “western breakfast” of pancakes and french toast. I have a long trip ahead of me and can’t wait to discover more of this incredible country. Only thing I have to worry about now is avoiding the chaotic driving system, that amazingly enough seems to be in a way organized. 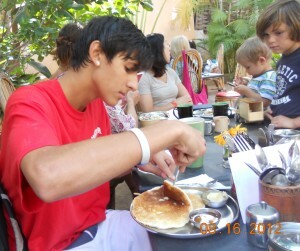 Parker enjoying pancakes at Anokhis.